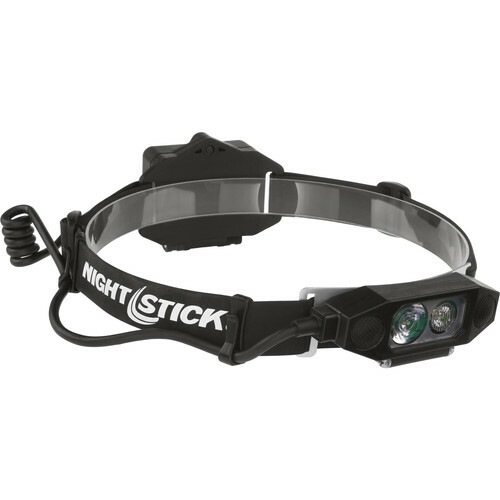 Designed for firefighters' helmets and hard hats with face shields, the Low-Profile Dual-Light Headlamp from Nightstick features a spot beam, a flood beam, and the ability to use both together for maximum illumination. Its three-AA battery pack is positioned at the rear to give the lamp a slim profile that face shields will clear. A rear-facing amber LED helps fellow first responders and coworkers keep you in sight in low-visibility situations. The lamp is operated by dual push-button switches on the front and can be tilted to put the beam right where you need it. The Total Internal Reflection (TIR) lens maximizes light output and beam shape. Rated IPX7 waterproof, this headlamp is designed to withstand wet conditions, and its rubber strap will grip a helmet or hard hat tightly so the lamp stays put.